Is proudly present the restaurant 'River Vibe' on the rooftop. It's now covering two floors with the panoramic 'Sunset Deck' where you can lay down with nice cold drinks while enjoying the best view in the city. A truely magnificent atmosphere, where it will help you enjoying your stay ever more. Rooms are decorated with Thai style in such sweet color wall panel. They are situated on 6th and 7th floor, allowing you to see our greatest curve of the river, and hanging out at our good size balconies. The double beds of 7th Floor rooms are specially facing the River View, for more romantic ambiance. With our neighborhood's influence, Dragon Move room is reflecting the Chinese style, matches with the Joe Sue Gong Temple's Dragon's Tails in front of us. 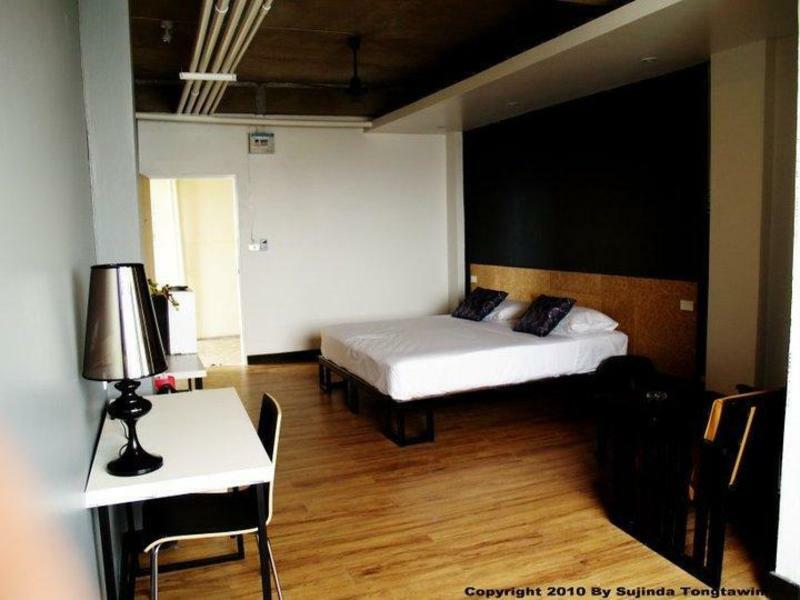 The rooms have black lacquered wooden floor matches with spicy red wall panel, this is one of our most a stylish room. Rooms on the 5th floor have balconies, but on 4th floor you will have up to 4 square meters larger space instead of the balconies, and large panoramic windows. Talad Noi is a truely Bangkok's Chinatown experience, it has more to offers such as 'Jo Sue Gong' Chinese temple built in 1804, Kalwa or Rosary Church, and Siam Commercial Bank. Out on the street it has plenty of restuarants, local shops. Yaowarat, Haulamphong, and Silom road is just a short distance away. Please visit our website www.riverviewbkk.com for details of map and directions. 1. From Suwarnaphum Airport, the best way to reach us is by taxi which would cost about 500 Baht. For public transportation, take the Airport Rail Link to Makkasan Station (40 Baht for City Line, or 150 Baht for Express Line.) From there, walk 5 minutes to MRT (underground) Petchaburi Station. Then take MRT to Hualamphong Station (30 Baht) and walk about 10 minutes to us or take a tuk-tuk (40-50 Baht.) In total total would be cost 70-230 Baht per person. 2. From Hualamphong train and MRT (underground)station, walk to Wat Trimit direction. When approching the red Chiness Gate circle, turn left to Charuenkrung Rd. Walk for about 20 meters then turn right to Songwad Rd., and you will find Soi Phanurangsri on the second left. (Soi means narrow road.) Go straight into the Soi, walk pass Soi Wanit 2 on the left, you will then have to turn left at the next small Soi. Go straight and the turn right. Walk straight until you reach San Jao Joesuekong, a chinese shrine, on your left. The River View Guest House is right behind the shrine.